Written and Sung by Pat Feeney. And if we don't get work, bedad! I'll go and rob a church! " " What! rob a church! "said Mick to Paddy, "how could you be so vile? But if you do, I'll go with you! we'll get safe out, I hope." We've got no bag to hold the swag, and before we go outside. With something stout and strong, my lad, the bundle must be tied!" Just then he spied the church bell-rope, and, swift as an antelope. He scrambled up on the belfry high to go and steal the rope. 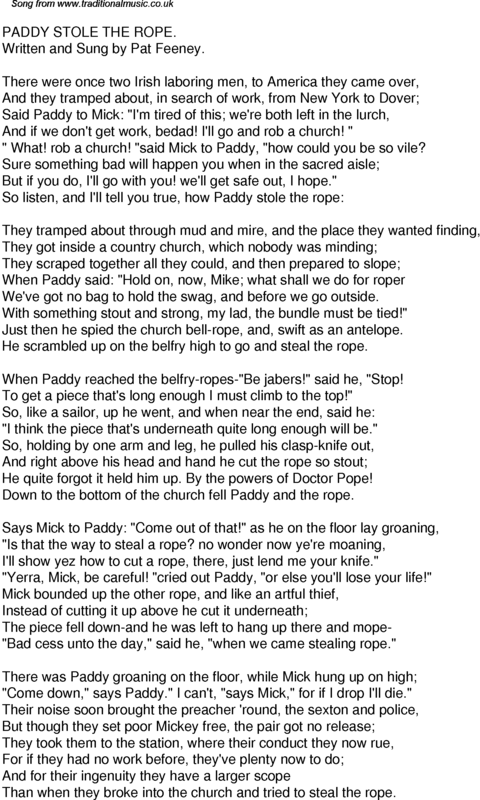 When Paddy reached the belfry-ropes-"Be jabers!" said he, "Stop! To get a piece that's long enough I must climb to the top!" "I think the piece that's underneath quite long enough will be." He quite forgot it held him up. By the powers of Doctor Pope! Down to the bottom of the church fell Paddy and the rope. I'll show yez how to cut a rope, there, just lend me your knife." "Yerra, Mick, be careful! "cried out Paddy, "or else you'll lose your life!" The piece fell down-and he was left to hang up there and mope�"Bad cess unto the day," said he, "when we came stealing rope." "Come down," says Paddy." I can't, "says Mick," for if I drop I'll die." Than when they broke into the church and tried to steal the rope.